Mark Geiger discusses the future of the music business. It’s grey, windy and chilly in Cannes, but at MIDEM inside the Palais, there are heated discussions. Mark Geiger, Global Head of Music, WME (USA), presented the fascinating and informative talk “20 Years of Pain. 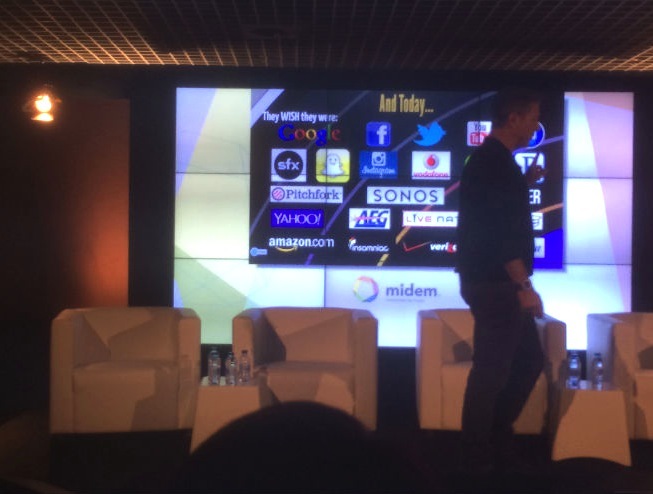 No More Fooling Around: The Definitive Future of the Music Business.” This was, by far, the most enlightening presentation at MIDEM. Artists often bad-mouthed labels and some openly cheered when the power of labels was diminished, but artists must be careful what they wish for. Geiger noted that sales of CDs have gone from $40 billion to three billion during a period when iTunes has gone from $5 billion to $25 billion in revenue, premium radio from $1-2 billion, artist channels from $1-2 billion and music access from $54 to $135 billion. The panel “Fueled by Video Success” was hosted by Andrea Leonelli with Digital Music Trends (U.K.) and featured Jordan Berliant, head of Music Management with The Collective Music Group (USA); Brandon Martinez, CEO of INDMUSIC (USA); Tom Pickett, Vice President of YouTube Content (Google, USA), and Geoff Taylor, Chief Executive of BPI and the BRIT Awards (U.K.). The issue of streaming proved to be a contentious one, with YouTube’s Pickett noting that “60 percent of viewership comes from outside the market,” noting that a problem with live streaming is the different time zones around the world. Berliant said, “We’ve done live streaming in the part with a Linkin Park show, but we face a problem because somewhere in the world it’s three in the morning while the concert is being held. The model that would work best is to have the live stream archived so fans can watch it when they want to.” The idea that fans don’t necessarily want to see something “live” but would rather watch it on their own time has proven to hold true. 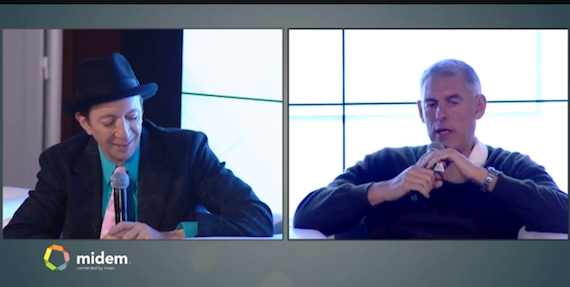 Tom Silverman (L) and Lyor Cohen. Lyor Cohen, former head of Def Jam and Warner Bros. Records, was the keynote speaker to discuss his new venture, 300. Tom Silverman, head of Tommy Boy Records, hosted the event. Cohen used the opportunity to announce a new partnership between 300 and Twitter. The panel for “Who’s Investing In Music” was hosted by Allen Bargfrede, Executive Director of Rethink Music; with panelists Benji Rogers, CEO of Pledge Music (USA); and Mike Tunnicliffe, Chief Growth Officer of GroupM/WPP, the largest marketing company in the world. Rogers noted that fans who donate to fund music projects fall into five levels: the casual fan donates about $68 per project, the next level is $182, followed by $344, the Digital Aficionado give about $402 per project, and those who want significant involvement give about $1,004. Rogers stressed that investing in bands with crowd sourcing entails the band involving fans in the “journey,” not just asking for money. Rogers also warned that “a business has a thousand moving parts and having thousands of investors could cause problems.” A single large investor—or several large investors—could cause problems if the investors want to dictate what the band should record or how they present themselves.